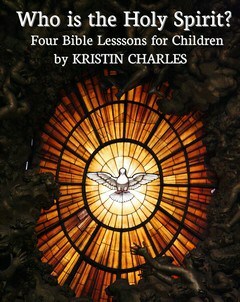 This is the fourth in a series of four Bible lessons for children teaching them about the Holy Spirit. Click here to see all the lesson plans. Don’t miss our many other Fruit of the Spirit resources. The particular lesson focuses on the “Fruit of the Spirit” that God produces in believers. It challenges children to examine the outcome of their lives. This lesson plan was first prepared for a Children’s Church setting, but would work well as a Sunday School lesson also. Through a Bible lesson, corresponding games, and an art project, students will learn to identify the fruits of the Spirit and reflect on their own standing with God. Optional: Try our Fruit of the Spirit game idea. Hold up two examples of fruit to your students (a piece of rotted fruit and a piece of good fruit). Say: If you had the choice, which piece of fruit would you eat: The nasty, disgusting, rotting, smelly fruit or the perfectly ripe, delicious, sweet smelling fruit? Why? We can learn from these pieces of fruit that some fruit is bad and some is good. That might seem obvious to us, but God has a lot to say about bad fruit and good fruit in the Bible. So far in our lessons on the Holy Spirit, we’ve learned Who He is, Where He can be found, and How He works in our lives. Today we’re going to learn a little bit more about What He does. Please turn with me to Galatians 5:22-23. You may have heard this verse a million times. I know I have! But let’s figure out what it really means today. But, we should see the fruit of love, joy, peace, forbearance (that means patience), kindness, goodness, faithfulness, gentleness, and self-control. Now I’m not going to be perfect because I still have a sin nature, but every day you should see more of these fruits in me. And, if the Holy Spirit lives in your heart, I should see these fruits in you. These are examples of good fruit in our lives. Now let’s talk about the bad. Maybe the Holy Spirit does not live in our hearts. Or maybe He does, but we are not following Him like we should. If that describes us, we’re going to produce bad fruit. The Bible says that bad fruit looks like these things: paying more attention to everything else but God (that’s idolatry), hating people, not getting along, being dishonest, wanting what others have (jealousy), being angry, being selfish (only thinking of you! ), fighting, complaining, arguing, and using your tongue for evil, just to name a few. So let’s try to figure out what fruit is good and what is not so good. Being usual grouchy me – DO NOT WAKE ME UP OR YOU WILL BE SORRY!!!! Give me that remote and give me it NOW!!!!!! ME! ME! ME! ME! ME! I am the most important person in the universe! Treat me that way! In Matthew 12:33-34, Jesus says, “Make a tree good and its fruit will be good, or make a tree bad and its fruit will be bad, for a tree is recognized by its fruit.” I love here how it says that, “A tree will be recognized by its fruit.” That means we will know what kind of tree it is by the fruit it has on it. In another part of Matthew it asks, “Do people pick grapes from thorn bushes or figs from thistles?” I might add, “Can you pick an orange from a Poison Ivy plant?” Umm…. Please don’t try this at home. No, of course you can’t! So…. What kind of tree are you? Are you a good tree with healthy fruit? Or are you a bad tree with rotten fruit? Have you asked Jesus to forgive you of your sins and to be made right with Him? Or do you think that you can have good fruit on your own? Remember that a tree is recognized by its fruit. You cannot live life without God and produce good fruit. You cannot be the “good” person that God desires on your own. You need the power of the Holy Spirit to work in you and through you. Only then, will you produce the kind of fruit that we call the Fruit of the Spirit! It is His work in you – nothing that you can do by yourself. Let’s work together to live our lives for God. As we grow in the knowledge of Jesus, the Holy Spirit will produce fruit in our lives. All we have to do is love Him! The Holy Spirit does the rest! All of the students should be seated in the circle, with one standing in the middle. The first student will say their fruit “Love” and then someone else’s fruit “Patience”. The competition comes when the student in the middle tries to “tag” the second person “Patience”, before he/she can say “Patience” and “Self-Control”. If “Patience” is tagged, he/she gets to be the person in the middle. If not, play continues with each student listing their own fruit and another’s fruit as well. If a student is in the middle for a long period of time, swap him/her out. The game can continue as long as time permits or until you feel as though they have a fair grasp of the Fruits of the Spirit. Secure the twig into the ball of Play dough or clay and firmly press into the plastic cup. Write the Fruits of the Spirit on the leaves provided. String yarn pieces through holes on leaves. Attach leaves to tree by tying a bow or a knot. Affix “Fruit of The Spirit” label to the front of the plastic cup. we work in South Africa as missionaries . We are in church planting, with a major focus on young people and children who live in the squatter camps (informal settlements) .On a usual Sunday morning we have upwards of 80 to 100 childrenin sunday school. the teachers I use now are the children who are now in their late teens and early twenties who first began in our sunday school. Pretty exciting work. I appreciated your lesson on the Holy spirit and am excited to find more lesson on your site. Tony Kummer (Editor) reviewed & updated this page on : August 27, 2012 at 7:35 pm. All our content is peer reviewed by our readers, simply leave a comment on any post suggest an update.